LOS ANGELES— Imagine a time when you can go out drinking without worrying about the hangover you will have the next day. Thanks to NILO Hangover Recovery that day is here. NILO Hangover Recovery is an all-natural, vegan remedy that will help you go from zero to hero after a long night of celebrating. With NILO, which is packed with ingredients proven to aid in the prevention of hangovers, you can seize the day, everyday. The main ingredient in Hangover Recovery is a powerful antioxidant called DHM which is derived from Hovenia Dulcis, a Japanese tree. DHM accelerates liver detoxification and minimizes the negative morning-after effects of alcohol. After over a year of perfecting the Hangover Recovery formula, NILO found just the right blend of DHM and other super antioxidants such as Glutathione, Milk Thistle, Chicory Root, Vitamin B Complex and electrolytes. Step 2: Take one full bottle while drinking. 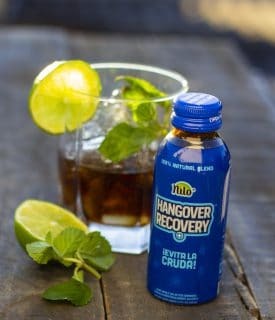 NILO Hangover Recovery is available to purchase through the website or at select online and retail locations including Northgate Markets, Marketon and Amazon. For more information about how Hangover Recovery works, visit drinkhangoverrecovery.com and follow @DrinkHangoverRecovery on Instagram and Facebook. Said Chedraui founded NILO in California in 2014. The premium brand was inspired by the Nile River, as this geographical landmark was the source of life to Ancient Egypt. NILO’s first product was NILO Pure Coconut Water with real coconut chunks which quickly gained popularity on the west coast and surpassed big brand names like Vita Coco and Zico in all retailers where NILO Pure Coconut Water was offered. NILO has since expanded to provide a variety of 100 percent natural Tropical Fruit drinks such as Guanabana Juice that derives from a super fruit known for its anti-Cancer properties. Its most recent product HANGOVER RECOVERY reduces the negative effects of alcohol. The company has continued to grow rapidly at 100 percent per year and selling $5MM after the second year. NILO products are now offered at over 3,000 retailers such as Northgate Markets, Ralphs, Food4Less, etc. For more information on NILO, please visit drinknilo.com/ or follow @DrinkNilo on Instagram and Facebook.